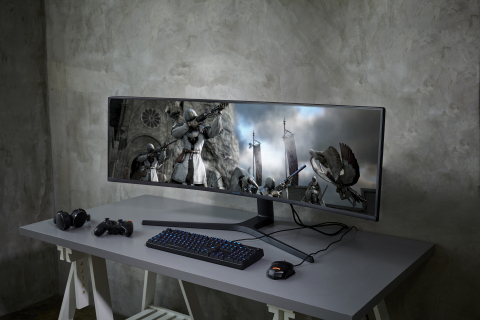 LAS VEGAS--(BUSINESS WIRE)--Samsung Electronics Co., Ltd. today announced three new monitors: the modern and minimalist Samsung Space Monitor, the CRG9 designed for an unparalleled gaming experience and the UR59C, a stunning 4K UHD curved monitor ideal for content creators. Each monitor offers the best in technology ranging from ultra-wide screens and lifelike colors for immersive gaming to space-saving designs that increase productivity. Samsung Space Monitor leverages its sleek design and functionality to allow users to focus on what’s on the screen and not what’s around it. Its unique built-in space saving solution, a minimalist, fully-integrated arm clamps to the desk and frees up desk space for ultimate user productivity. Samsung Space Monitor is easy to set up and adjust when you aren’t using it, and simple to push back and store flat against the wall. 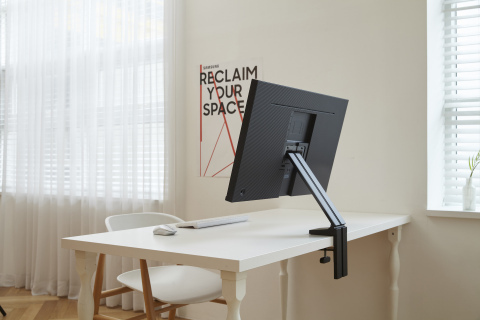 Through easy ergonomic adjustment, port access, and a discreet cable management system, Space Monitor improves the form and function of any workstation or home office. 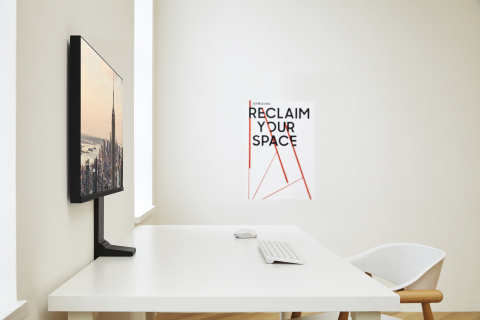 Beyond aesthetics, Samsung’s Space Monitor is a feature-rich, high-performance monitor. The 27-inch model offers QHD resolution for incredibly detailed, pin-sharp images, while the 32-inch model presents content in 4K UHD. Space Monitor gives has a unique arm stand, which can disappear into the back of the monitor’s slim-bezel. When using the stand, Space Monitor can be easily tilted or extended from the wall. 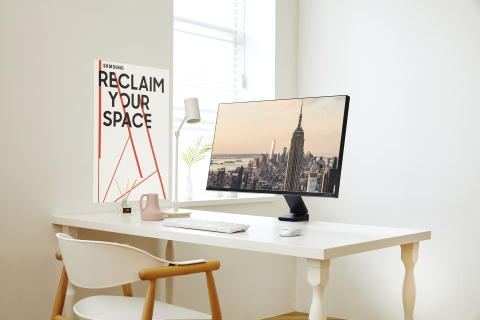 It can also be lowered to the desk surface, and Samsung’s Zero Height Adjustable Stand feature provides the ultimate versatility for any type viewing preference. The stand not only makes viewing more comfortable, but also eliminates the hassle of cable management by integrating power and HDMI cords through the arm for a clean, flexible look. The CRG9 is the world’s first high-resolution, super ultra-wide gaming monitor with a 32:9 aspect ratio. It offers a 120Hz refresh rate with a fast 4ms response time on a 49-inch display that minimizes image lag and motion blur to effortlessly keep up with fast-paced games. Built for a superior gaming experience, the monitor also features AMD Radeon FreeSync™ 2 HDR Technology to reduce stutter, screen tearing and input latency to ensure the best possible frame rate and smoothest gaming experience. Content comes alive on the CRG9, with dual QHD resolution (5120x1440) and HDR10 and a peak brightness of 1,000 nits, providing superfine detail in the brightest and darkest parts of an image. HDR10 delivers outstanding local dimming, and high-contrast HDR offers advanced specular highlights not available in traditional gaming monitors. The monitor also leverages Samsung’s revolutionary Quantum dot technology for an exceptionally wide range of accurate color reproduction, and a 1,800mm screen curvature and an ultra-wide field of view for complete visibility. Equivalent to two 27-inch QHD 16:9 monitors placed side-by-side, the 32:9 super ultra-wide screen also provides ultimate multitasking flexibility, assisted by PbP (Picture-by-Picture) functionality to allow two video sources to be viewed on the same screen. The CRG9 includes one HDMI port, two Display Ports, USB 3.0 and headphone connectivity options. Samsung also designed the CRG9 with a smaller stand size for convenience and flexibility in every gamer’s space. Ideal for content creators that seek both versatility and performance, the new UR59C 32-inch monitor features a UHD curved display with a 2,500:1 contrast ratio and full 3840x2160 4K UHD resolution with support for up to one billion colors. The 1500R curvature delivers a truly immersive experience that shines while creating content and art, watching videos or gaming. Available in Dark Blue Gray, the UR59C has a super-slim design, with a depth of only 6.7mm. Its 31.5-inch display is attached to a clean and simple two-prong base that reduces its footprint on the working surface. 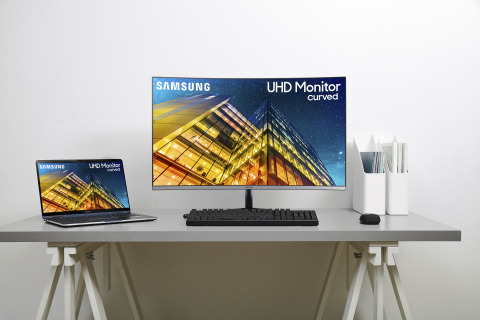 Samsung Space Monitor and the UR59C are available now for pre-order exclusively at BestBuy.com, Amazon.com and Samsung.com, and the CRG9 will be available later in 2019. Experience all three monitors at Samsung’s CES booth #15006 at the Las Vegas Convention Center from January 8-11, 2019. For additional information on Samsung’s gaming monitors, please visit www.samsung.com.